Description: Early Judaism and early Christianity emerged during the Hellenistic and early Roman imperial era. They were, naturally, confronted with the Hellenistic and the Roman religion. The question therefore arose as to whether Jews or Christians were free to participate in religious activities alien to the religious heritage of their own. In his articles, Karl-Gustav Sandelin presents documentary material showing that this problem was a burning issue within Judaism from the beginning of the Hellenistic period until the end of the first century C.E. Several Jewish individuals converted to the Hellenistic or the Roman religion. Such behavior was also discussed and generally condemned, for example by the Books of Maccabees and authors such as Philo of Alexandria and Flavius Josephus. A similar problem is to be found in the New Testament, notably in the letters of Paul, especially in the first letter to the Corinthians and in the Revelation of John. 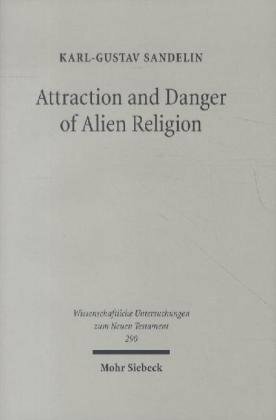 Citation: Erich S. Gruen, review of Karl-Gustav Sandelin, Attraction and Danger of Alien Religion: Studies in Early Judaism and Christianity, Review of Biblical Literature [http://www.bookreviews.org] (2014).